Wolf skull thought to be 2000 years old. 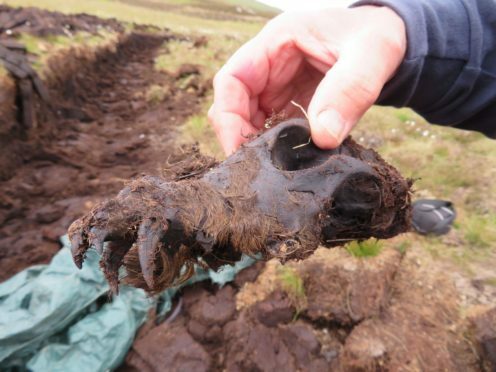 The remains of what is believed to be a 2000-year-old wolf has been discovered in the Highlands. A digger driver was extracting peat for crofter Duncan MacKay at Rogart in Sutherland when the remains were found five feet deep. Mr MacKay, 66, was so intrigued by the find he contacted Brora Heritage Centre and archaeologist Dr Nick Lindsay, chairman of Clyne Heritage Society, was called in and later excavated a preserved skull, bones, teeth, claws and thick fur coat. He said: “It’s in amazingly good condition, perfectly preserved by the acidic peat. “The carcass, which had been a little mangled by the digger, so it wasn’t a perfectly formed body. 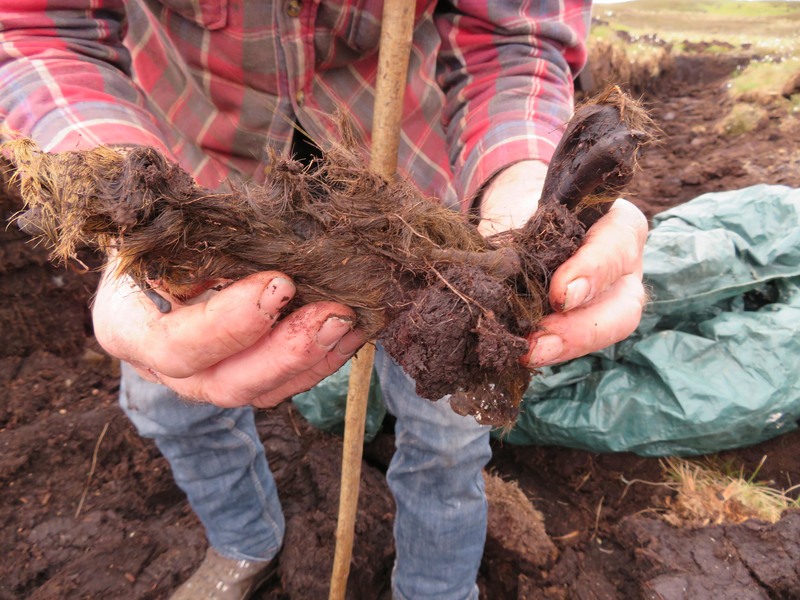 It was 1.5m down in the peat and I carefully excavated it and collected all of the disturbed bits that lay around. I think it is almost certainly a young wolf. Dr Lindsay took the find to Inverness Museum, where conservator Jeanette Pearson is to make a definitive identification. Ironically the find comes as wolves could return to the Highlands behind “Jurassic Park” fences to cull deer, say scientists. They believe a “very large fenced reserve”, ideally 1,000 square kilometres, would provide a home for around 80 wolves. The researchers from University of Sussex say the fencing would help limit encounters with Highland residents while encouraging tourism. It comes as millionaire landowner Paul Lister continues to pursue his plan to set up a wolf reserve at his Alladale Wilderness Reserve in Sutherland. Critics, including Scottish Rural Economy Minister Fergus Ewing, and farmers oppose wolves’ reintroduction on the basis it could threaten farmers’ livelihoods and restrict public access to areas of natural beauty. The researchers claim high red deer densities – up to 40 deer per square kilometre – are preventing tree regeneration and ecosystem restoration in parts of the country. A carved stone by the side of the A9 near Brora claims to mark the site where the last wolf in Sutherland was killed by a man called Polson in 1700. Another account says that the last wolf in Britain was killed by Sir Ewen of Lochiel in 1680. However, many historians believe the very last one was dispatched near Findhorn, Moray, in 1743 amid an outcry that it had killed two children.